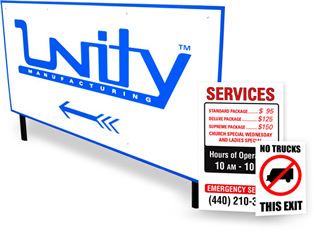 Aluminum signs are highly durable, light-weight, & come in a numerous substrate colors to fit your needs. These signs can be used on Buildings, be informational, directional,& etc. For custom sizes contact us for a quote to discuss your needs. With cut vinyl lettering/graphics on white 040 Aluminum, 1 sided. Max metal and 080 Aluminum pricing is for white finish. Minimum art charge of $20 unless simple text design, artwork/file set-up will be assessed per order. Mock-ups and additional proofs extra. 1" Framing is recommend for building signs for a more complete look, however not necessary. For full color graphics to be added, go by the 3 color pricing. Install is separate. For different substrates and colors other then white, please call for a quote. Specialty vinyls are extra, pricing includes regular vinyl colors. With cut vinyl lettering/graphics on white 040 Aluminum. Additional charge for different substrates (listed below). Minimum art charge of $20 unless simple text design, artwork/file set-up will be assessed per order. Mock-ups and additional proofs extra. For full color graphics to be added, go by the 3 color pricing. Install is separate. Max-Metal/Polymetal are two particular brands of substrate that have a metal laminate finish and 3mm PVC core. These come in different sizes and colors, call for availability.